As any self respecting conference organiser will tell you – “keep a speaker up your sleeve for a last minute announcement” 😉 and that is exactly what we have done – not ‘one’ in fact, but TWO!! 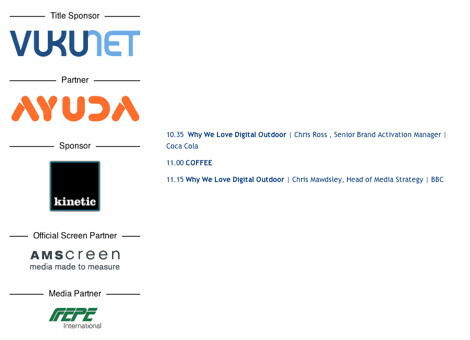 Observant readers will have noticed that the agenda item ‘Why We Love Digital Outdoor‘ was effectively an empty speaking slot (shown above but NOW filled). However, we are delighted to be able to reveal that joining our already impressive speaker line up is both the BBC and Coca Cola. Registrations for The DailyDOOH Media Summit are fast approaching 150 – a number we really did not think we would ever get near. This entry was posted on Friday, May 9th, 2014 at 12:18 @554 and is filed under DailyDOOH Update. You can follow any responses to this entry through the RSS 2.0 feed. You can leave a response, or trackback from your own site.